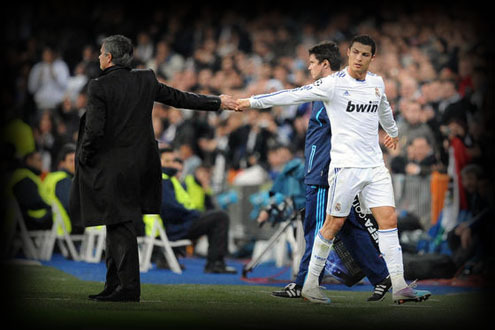 07.04.2011 » Mourinho: "If Cristiano Ronaldo leaves Real Madrid, I'll also leave." José Mourinho shouted loud and clear that he'll also leave Real Madrid if Cristiano Ronaldo gets transfered. This strong reaction, comes as a response to Silvio Berlusconi's comments about wanting to transfer Cristiano Ronaldo to AC Milan. José Mourinho commented today Silvio Berlusconi's intentions about buying Cristiano Ronaldo and moving him to AC Milan. The Portuguese coach was very direct like he usually is and left a warning to Real Madrid's board, by clearly saying that if Cristiano Ronaldo leaves Real Madrid, then he'll follow his footsteps, but not necessarily to AC Milan. Real Madrid's dependence on Cristiano Ronaldo seems to be bigger than ever and Mourinho just assumed that the entire football project for Real Madrid's future in the next years is depending on CR7: "In football, everything is possible, but if Cristiano Ronaldo leaves the club, I'll also leave, not to AC Milan though", said the Portuguese coach to Mediaset Premium, which is also owned by Silvio Berlusconi, AC Milan's President and Italian Prime-Minister. These José Mourinho's statements can be simply read as a blackmail to Florentino Pérez, just to be sure CR7 will keep in Real Madrid. As long as everyone is happy with the "Special One" at the club, but also, if the team's main reference, Cristiano Ronaldo, doesn't get transfered elsewhere, the Portuguese coach should stay in Madrid at least for the short term. However, José Mourinho's future adventure will probably pass through England, like he confessed in the past, but everyone knows that Mourinho wants to leave his mark in Real Madrid and probably won't leave untill he wins a few major titles. Remember that you can watch Athletic Bilbao vs Real Madrid livestreams, online here on ronaldo7.net, this Saturday. Cristiano Ronaldo is expected to play, but there's still some doubts on his presence for this game.